You have a great product or service, but now your business success lies in your marketing. Content should be the heart of your marketing strategy. Through it, you’ll be able to educate and introduce your audience to new ideas, generate interest into a topic, or establish validation of a problem that businesses should be concerned about solving. Your content should be thought-provoking, inspire change, teach, and provide actionable, next-step recommendations. Content is most valuable as part of a multi-step campaign, and our Webinars are designed to fit into multiple stages within your campaign. The Ventana Research Webinar is a presentation via web service that provides an examination of a topic using research and insights drawn from our benchmark research, and from the subject matter experience of our analysts. We provide an intensive exploration, in 30- & 60-minute formats, covering a specific business and/or technology related issue with research facts and best practices that engage the viewer. It is designed both to educate and to explore best practices and paths to optimal performance. We work with you to create a webinar specific to your needs and goals. We do the heavy lifting to create a webinar on a mutually agreed upon topic that speaks to your audience using our expertise and only our own market facts. Your organization will have exclusive distribution rights to the webinar we create during the licensed period. 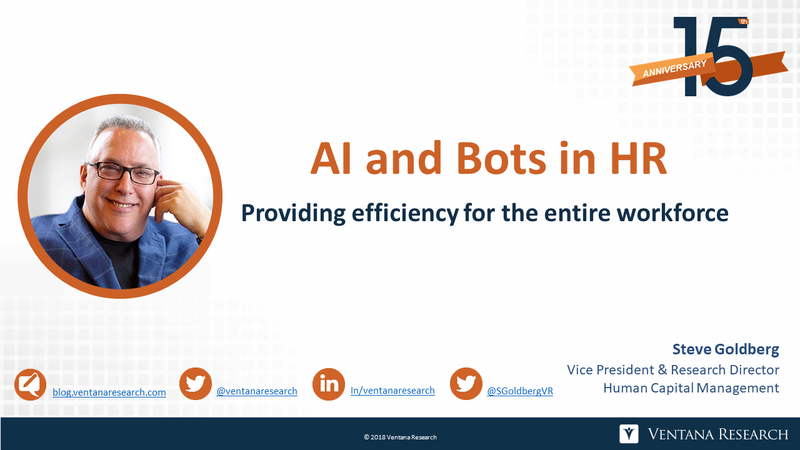 HR departments are like the proverbial kid in a candy store when it comes to selecting AI and bots “goodies” to lobby for and ultimately deploy. In the digital era, capabilities not even on the radar as recently as a couple years ago are getting increasing air time in HR staff meetings, including themes such as personalizing the employee experience based on machine learning. Today’s marketing organizations still operate using last decade’s marketing methods, continuing to invest in outbound emails, trade shows and events and PPC and SEO across the Internet and social media. But the pressures of GDPR and other new regulations guiding the use of personally identifiable information (PII), are forcing marketing organizations to find innovative and effective digital approaches to create and capture marketing leads. Real time and event-driven architectures are emerging as key components in developing streaming applications. Nearly half of organizations consider it essential to process event data within seconds of its occurrence. Yet less than one third are satisfied with their ability to do so today. Attend this free webinar featuring Dave Menninger of Ventana Research to learn from the firm’s benchmark research what streaming data is and why it is important.